The US chemical industry is pushing back hard against the Trump administration for escalating a trade war with China, which it fears could especially damage America’s chemicals sector. The US Trade Representative (USTR) announced earlier this month that an additional $200 billion (£153 billion) in Chinese goods, including a significant number of chemicals, will be subject to a 10% tariff that could take effect as soon as September. Among the Chinese chemical targets for the new tariffs are ethylene propene, acyclic hydrocarbons, ethylene glycol, as well as plasticisers of aromatic polycarboxylic acids. Of the roughly 6000 products on the USTR’s new list of Chinese items slated for the additional 10% tariffs, more than 1500 are related to chemistry, and these are worth $16.4 billion – about 8% of the $200 billion total, according to ACC analysis. Specifically, the ACC says 286 of the 1505 chemicals and plastics products listed by the USTR for the additional taxes are not even imported from China, and 77 of those products are not imported from any foreign supplier at all. However, the trade group points out that 44 products originate entirely from China, and for 299 of the products listed, 50% or more of foreign supply originates from China. Therefore, the ACC asserts that these tariffs would considerably disrupt supply chains, suggesting that the imposed tariffs will ‘significantly disadvantage and reduce the competitiveness’ of US chemical manufacturers. The US Plastics Industry Association (Plastics) is also concerned about this proposed 10% additional tariffs on plastic materials, machinery and other products from China. ‘This disruptive approach to trade policy endangers the gains that America’s $404 billion plastics industry has made as a result of this administration’s achievements on comprehensive tax and regulatory reform,’ said Plastics’ president and CEO, William Carteaux. ‘Tariffs threaten to boomerang on the very workers they’re supposed to help, and will only further undermine the confidence manufacturers need to make investments in new equipment, facilities and people,’ he warned. 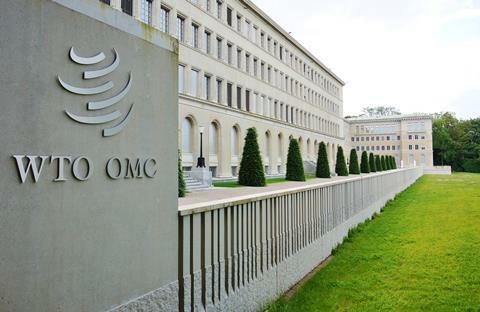 China’s Commerce Ministry announced on 16 July that it has filed a complaint against the US with the Geneva-based World Trade Organization (WTO) related to these proposed tariffs. Meanwhile, eight US trading partners have already challenged the 25% on steel and 10% on aluminium that Trump announced in March against China, and on Canada, Mexico and the EU the following month. However, the US fought back by initiating its own WTO disputes against China, the EU, Canada, Mexico and Turkey, also on 16 July, for the retaliatory tariffs they have imposed on more than $20 billion worth of US exports in response to Trump’s duties on their steel and aluminium exports. The US argues that the steel and aluminium tariffs that Trump imposed are justified, but retaliatory duties on US exports imposed by China, the EU, Canada, Mexico and Turkey are without merit. The Trump administration has said its sanctions attempt to address China’s unfair trade practices with regard to intellectual property and innovation. The USTR notes that its exhaustive eight-month investigation concluded in March that China has actively worked to steal US intellectual property, including trade secrets or other confidential business information, to gain competitive advantages for its companies or commercial sectors. In its report, the USTR also cited examples of ‘brazen’ Chinese efforts to steal American intellectual property, including the systematic tracking of the research agency grantees and research of scientists at universities across the nation. Lawmakers and others voiced similar concerns on Capitol Hill in recent months. Witnesses at a congressional hearing in April urged US academic institutions to do more to protect their researchers’ work, as well as their scientific assets and taxpayer investments in federally funded science. Congressional representatives on both sides of the aisle have echoed these calls to action. Meanwhile, there is some concern that the US government is unfairly persecuting Chinese Americans in its pursuit of espionage prosecutions. Indeed, the authorities did eventually drop some of the most high profile of these cases. The US Commission on Civil Rights (CCR) first raised such red flags back in November 2015, suggesting in a letter to US Attorney General Loretta Lynch that the US government has unjustly pursued Chinese American scientists. ‘We are concerned that the government is failing to exercise sufficient due diligence when targeting Asian Americans for investigation, surveillance, and arrest, due to their race or national origin,’ the CCR warned Lynch. The organisation’s letter referenced recent news reports that had detailed embarrassing attempts by the US federal government to prosecute Chinese Americans for spying and economic espionage, only to drop the charges following revelations of serious underlying errors. Inside and outside of Capitol Hill there is recognition for the importance of preserving the open and collaborative nature of US academic research, but several significant proposals have come before Congress. For example, witnesses at congressional hearings this year have advocated greater monitoring and oversight of visa holders, as well as the creation of a comprehensive White House database that would track visa holders’ fields of study.